LACING: Decent. Not glass-coating, but a nice little tree-ring effect. NOSE: There’s no mistaking the nose. A quintessential dry stout. 3 parts chocolate to 1 part coffee beans, and not much else. TASTE: Like the Sixpoint Bengali Tiger, the Diesel puts its best foot forward. In this case, it’s the dark-roasted malt which is redolent of cocoa powder and lightly-roasted coffee beans. A hint of bitterness from the alcohol gives it a dry finish. Sixpoint doesn’t let the hops interfere with the taste on this one and it seems to work. Just an old-fashioned American Stout all around. MOUTHFEEL: Medium-bodied with somewhat aggressive carbonation and a dry, clean finish. DRINKABILITY: High. 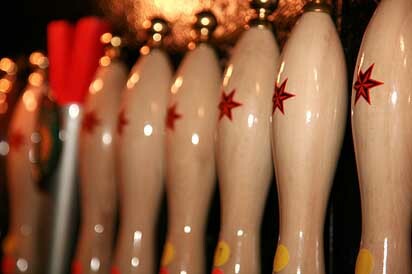 Sixpoint’s M.O. seems to be making classic, thoughtful versions of popular styles. Nothing fancy. Nothing too complex. Just drinkable, balanced brews. Posted in Tasting Notes.Tagged Diesel, Pub & Kitchen, Sixpoint, Stout.